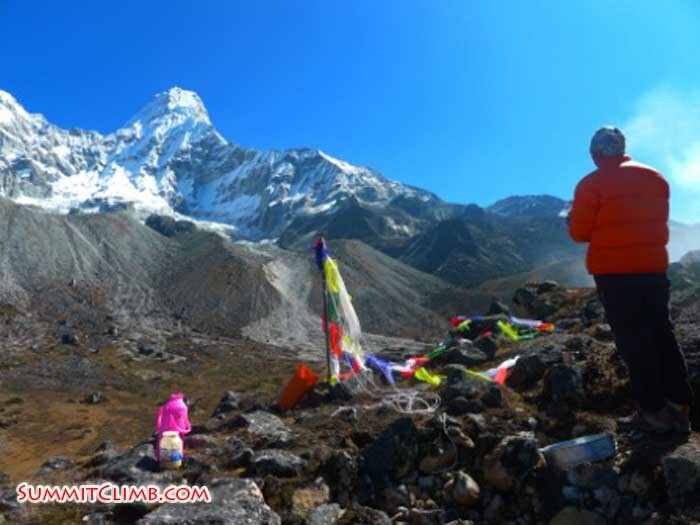 Maaike Braat (The Netherlands) and Gyelje Sherpa summited Ama Dablam on 9 November, 9:45 am. Congratulations! " In addition to the previous summit we have to add Maaike Braat. She summited on the 9th November on 11am. She left camp 2.7 early in the morning. Her summit day was clear, but windy and cold. The cold dint hold her off! 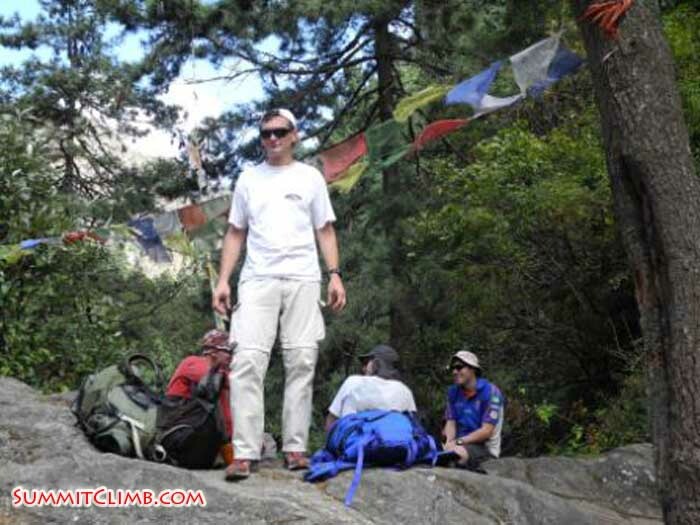 Maaike was the last team member that summited and is on her way back to Kathmandu now. Our staff took down base camp and is also on their way back. 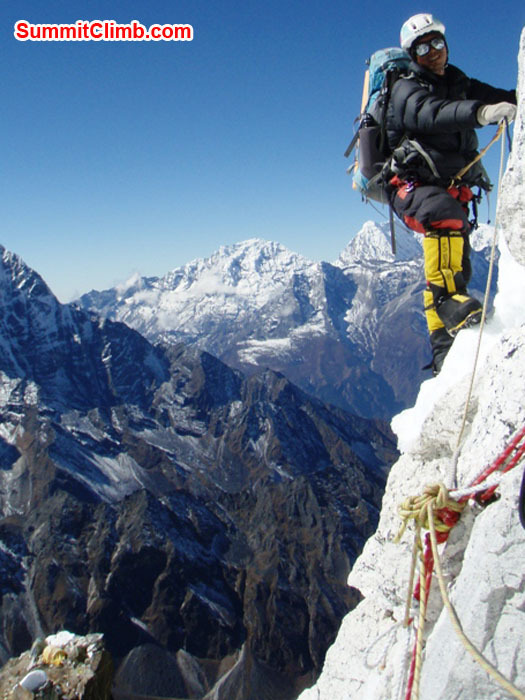 Ms. Marigje E. Braat, from the Netherlands, on the summit of Ama Dablam, Novenber 15th. Photo by Gyelje Sherpa. 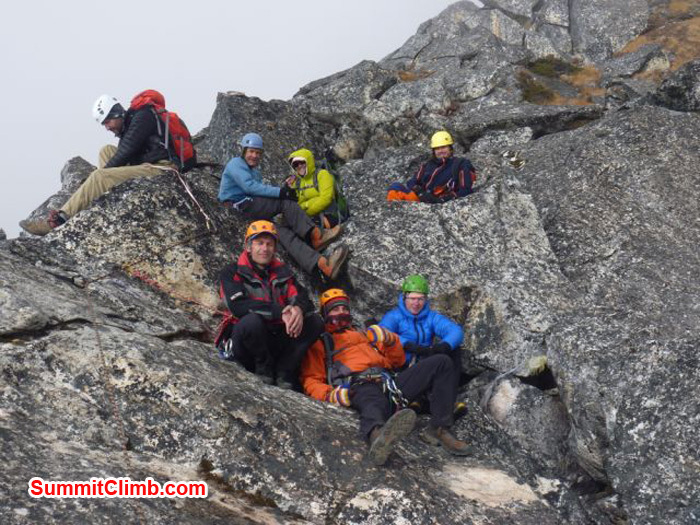 Arnold Coster, the Netherlands, Summit 28 October 10:30am. Behind Everest, Lhotse. Photo Kunnar Karu. Jangbu Sherpa, Nepal, Summit 28 October 10:30am. 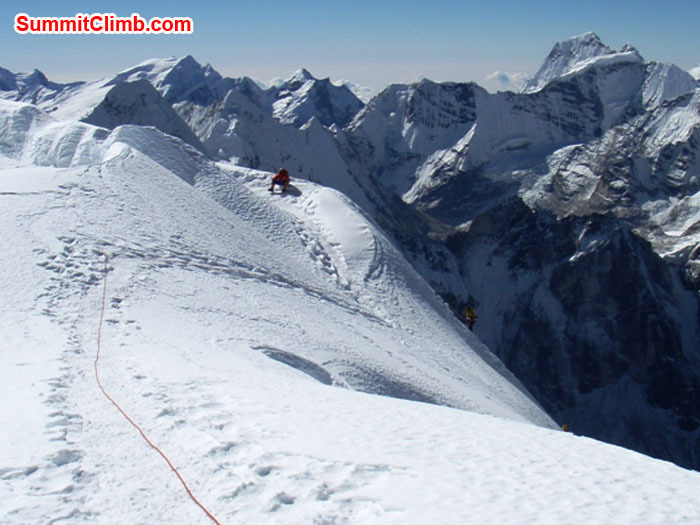 Behind Everest Lhotse. Photo Kunnar Karu. Kunnar Karu, Jangbu Sherpa, and Arnold Coster at Summit of AmaDablam showing Nepal National Flag. Photo Kunnar Karu. Kunnar Karu, and Arnold Coster at Summit of AmaDablam showing Nepal National Flag. Photo Kunnar Karu. 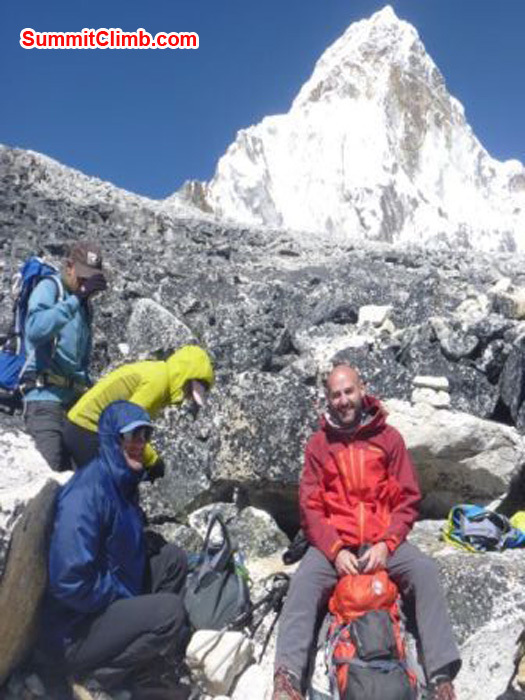 Kunnar, Arnold and Jangbu on the Summit of Ama Dablam. 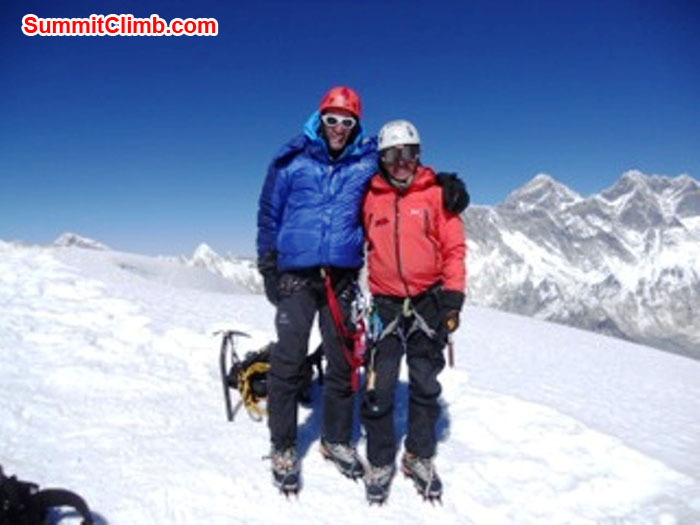 Miguel Cruz y Celis Ehlinger and Hector Ponce de Leon , both from Mexico, on the summit of Ama Dablam. Photo by Palden Sherpa. 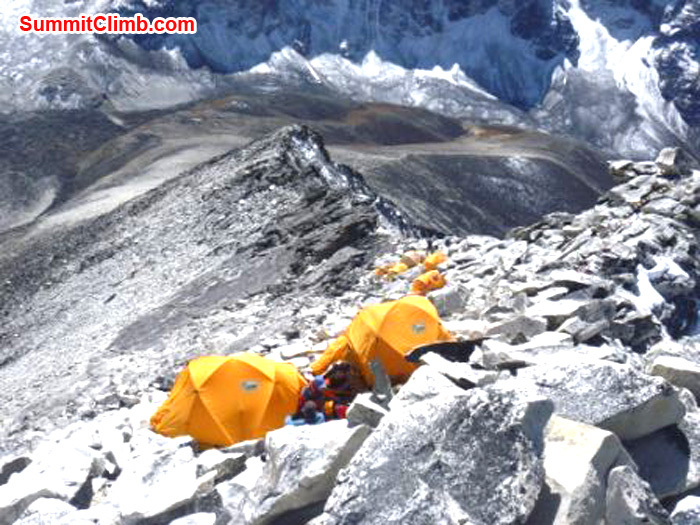 One hour later Dimitri and Gyalze Sherpa reached the summit at about 11.30 in the morning. We had a beautiful summit where the weather was incredible: no winds, good views and on the way down we had some snow in the afternoon then we reached camp 2 and we spent another night in Camp 2. Everybody was tired by the time we got there as we had been outside for about 18 hours. This morning we descended to Camp 1 and we had a nice breakfast and we’re going to Basecamp now to have a shower and some more good food. Herni finish climbing yellow tower. Photo Kunnar Karu. On mushroom ridge. Photo Kunnar karu. 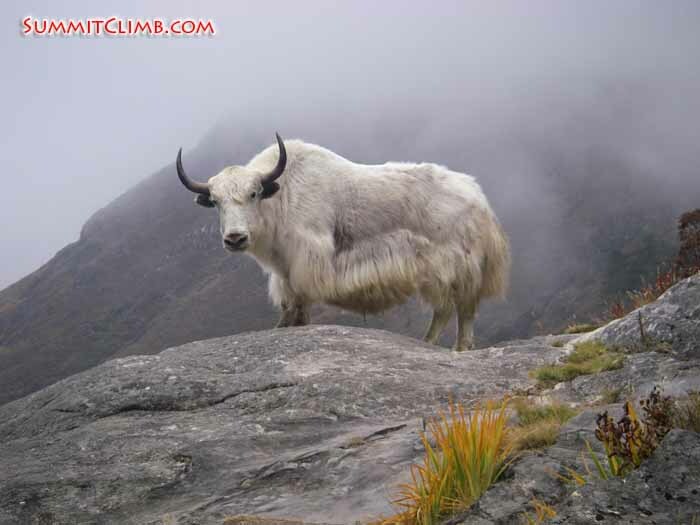 Hello SummitClimb News this is Arnold, the leader of the Ama Dablam expedition calling from Camp 2 at about 5950m. 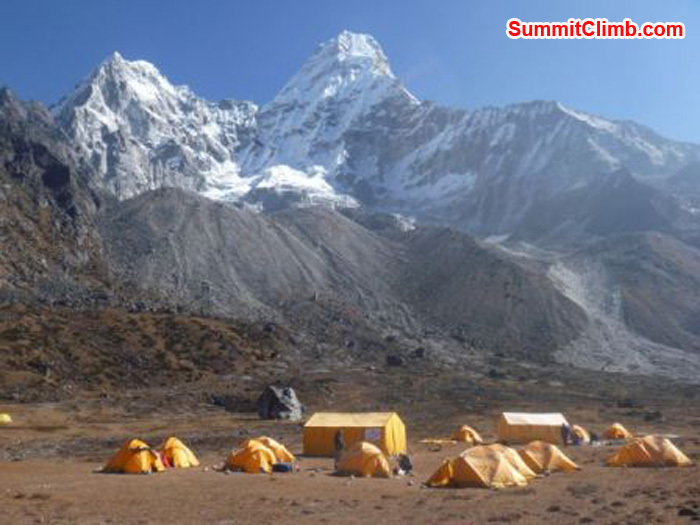 Today we had a little bit of traffic climbing to camp 2 which made us arrive a little bit later in camp 2 than expected but no problem, everybody made it here in good shape and miraculously all of the traffic dissolved and all of the people turned around and now we can continue to camp 3. So tomorrow we will be all alone on the summit which is great. We’re here in camp 2 having some food and a little bit of a rest. The plan is to set off at midnight tonight so we will summit early in the morning and we have all day to get down to Camp 1 again. 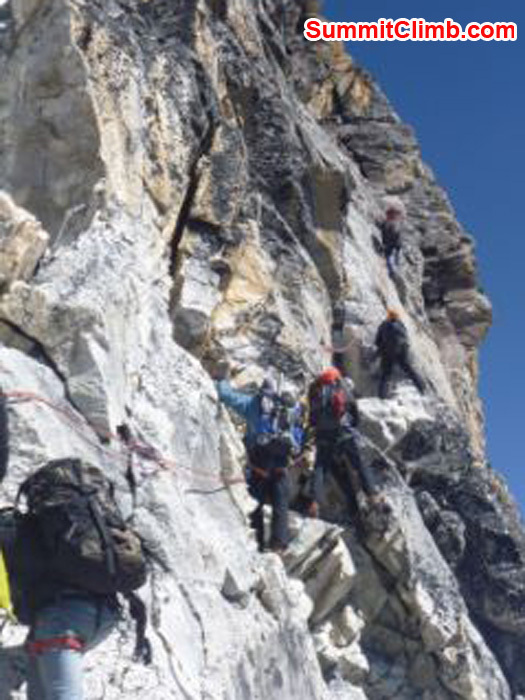 I’m here with Henri, Dimitri, Kirk, Kunnar and me along with Janbu Sherpa, Palden Sherpa and Gyalze Sherpa so we have a very strong team and I’m sure we’re going to make it. Right now it’s a little bit cloudy outside, it’s a very good night it’s not too cold and not windy at all so I’m sure when we wake up tonight it’ll be very good weather. Mike and Jennifer have stayed behind in basecamp as they have decided they need a little bit slower schedule and they need a little bit more rest but that’s no problem. 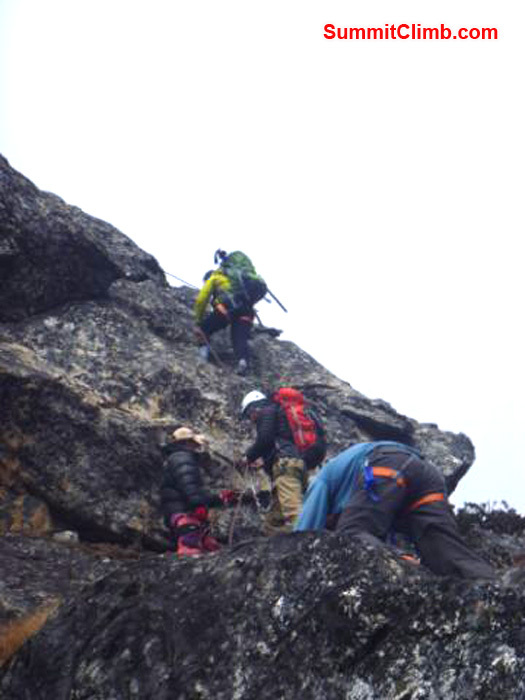 So probably when we go down we’ll meet them in the capable hands with Ang Dorjee Sherpa. That’s all for now and I hope tomorrow I can tell you all about the summit. The amazing camp 2 at 6000m - Romain Hoffmann. 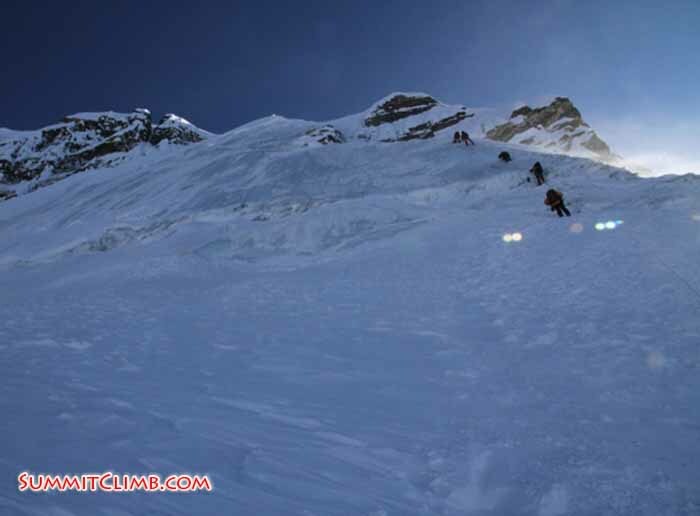 Team pushing for the summit at 6600m - Jean-Michel Meunier. 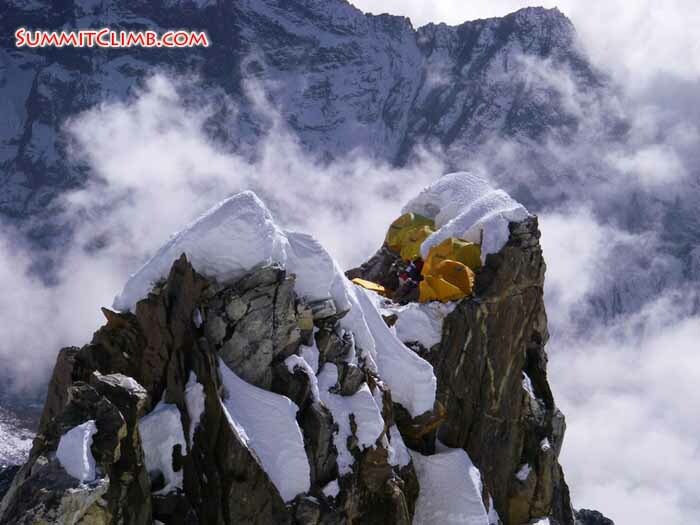 Hello SummitClimb News, this is Arnold Coster the leader of the Ama Dablam Expedition calling from Camp 1 at 5700 metres. 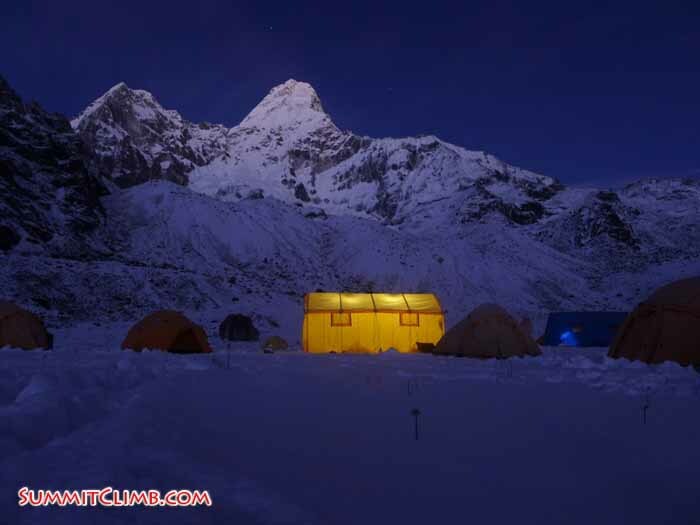 I’m sitting here in our kitchen tent and just finished a delicious meal which our Sherpas made for us. Camp 1 is very comfortable. The plan is that tonight we’ll sleep in Camp 1. Tomorrow we hope to reach Camp 2 at 5950m and rest there all day because we will be there early in the morning and in the middle of the night we’ll set off for our summit push. Tthe plan is to summit on the 28th if everything goes well. 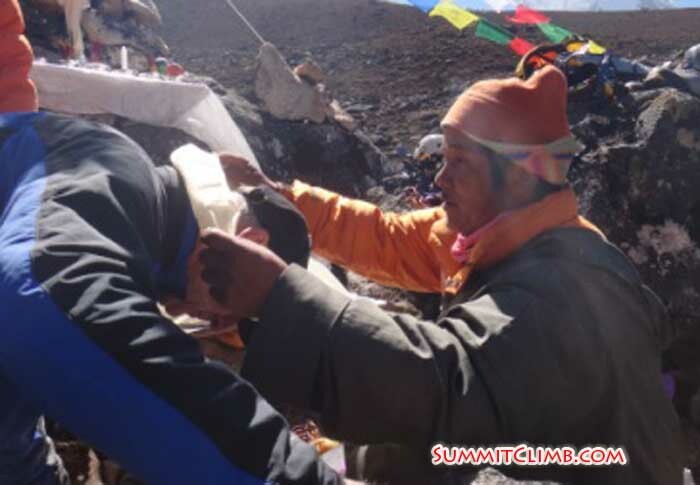 Then we have a second summit party with Mike and Jennifer and Ang Dorjee Sherpa. They just need a bit more time to rest which is no problem because we still have a lot of time on our expedition. We hope to see them the next day and they’re hopefully going to summit one day behind us. I’ll keep you updated; tomorrow we’re going for camp two. That’s all for now bye bye. 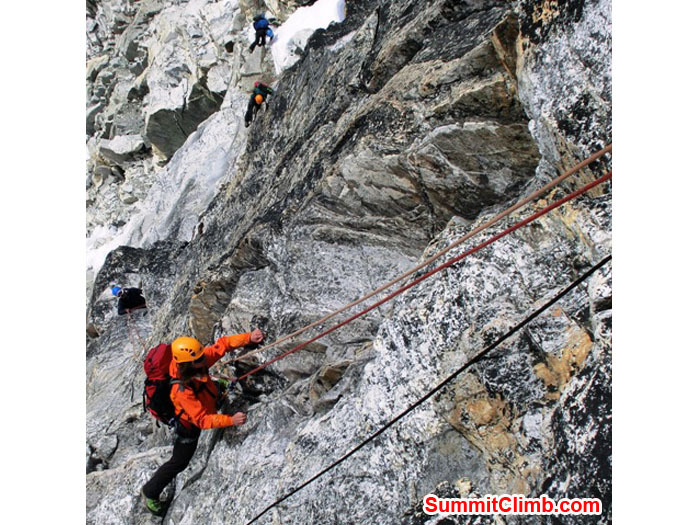 Team climbs the yellow tower at 5900m, the crux of the climb. Approaching yellow tower snow ridge below. Photo Kunnar Karu. On the way to camp 2 Kunnar Karu. Photo Kunnar Karu. On the way to camp 2. Photo Henri Geller. Camp 1 at 5700m. Photo Arnold coster. Camp 1, Henri Geller waving. Photo Kunnar Karu. Member getting blessed by the lama during our puja (Grace McDonald). Our puja, Tenji holding a cup of Rakshi (Liam Suckling). The next morning we woke up early for our hike to Namche Bazar. 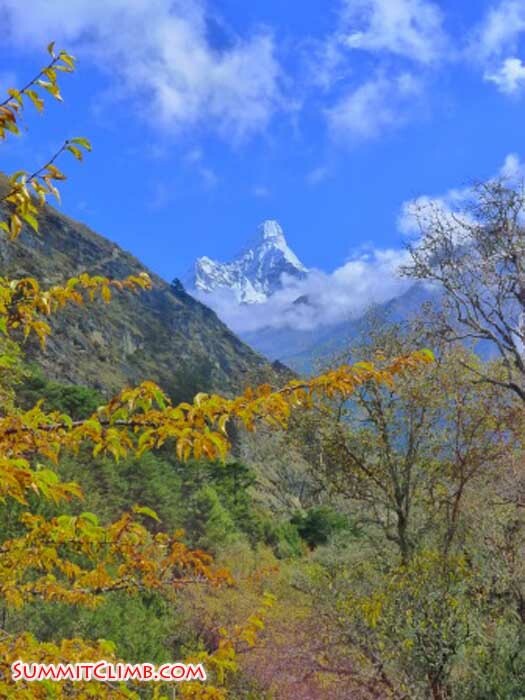 It’s a beautifull walk true the pine forest alongside the Duth Koshi river. Team having lunch on the way to Namche. 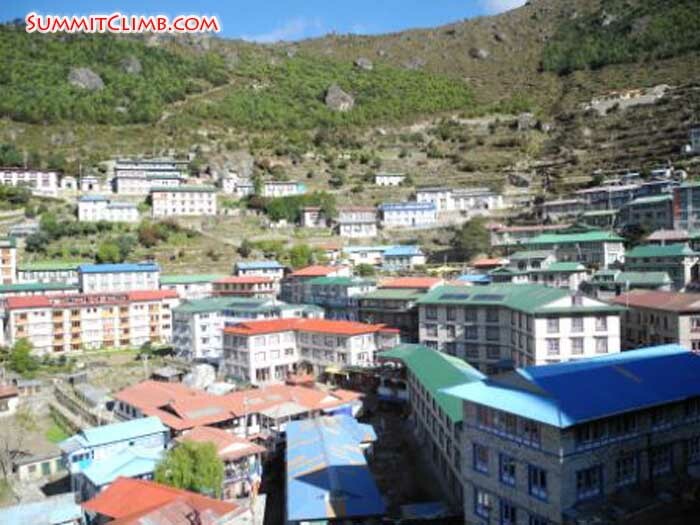 Namche Bazaar, the sherpa capital (Violetta Pontinen).